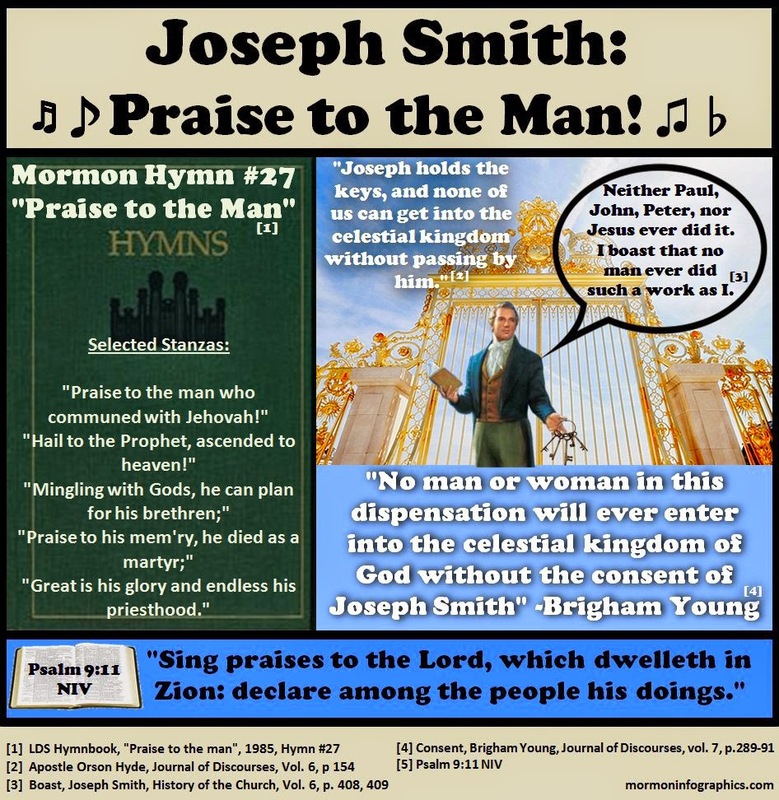 Mormon Infographics: Joseph Smith: Praise to the Man! "Joseph holds the keys, and none of us can get into the celestial kingdom without passing by him." proclaim among the nations what he has done." This is an interesting blog post. If one is a believer it would seem to be confirming. But to outsiders it wouldn't necessarily appear much different than one of those Hitler youth rallies of the late 1930's. Perspective is everything. It's a really popular hymn is LDS culture. I'd say that most Mormons don't have or see any problems with it. What's wrong with Praising and Worshiping Jesus ? We worship the Father and him only and no one else. We do not worship the Son, and we do not worship the Holy Ghost. I know perfectly well what the scriptures say about worshipping Christ and Jehovah, but they are speaking in an entirely different sense--the sense of standing in awe and being reverentially grateful to him who has redeemed us. Worship in the true and saving sense is reserved for God the first, the Creator. Christ worked out his own salvation by worshiping the Father. intelligence that made him like unto God; after he had become, under the Father, the Creator of worlds without number; after he had reigned on the throne of eternal power as the Lord Omnipotent--after all this he yet had to gain a mortal and then an immortal body.